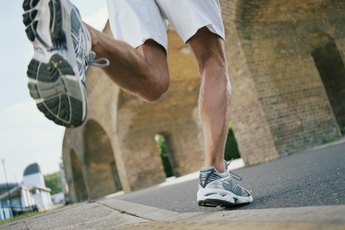 Wear the right athletic shoes to prevent sore calves. If you’ve experienced sore calves after a workout, you know it can make the rest of your day miserable. Wearing the wrong shoes can make your calf muscles ache. No one type of shoe can be the cure-all for calf pain. To prevent sore calves, buy shoes designed for the sport or type of workout. If you are a runner, you need a running shoe that gives you support and helps your foot move fluidly through your gait. Gait varies by person; therefore, the best shoe for you may not be the type of shoe your running partner wears. In general, running shoes are light, flexible and have a narrow heel base that doesn't provide lateral stability; you don't need lateral stability when running. Buy running shoes that fit your arch, feel snug in the heel and have cushioning in the forefoot. Some sporting goods and specialty running stores are equipped to analyze your running gait in house. By using state-of-the-art technology, they can recommend the best running shoe for you. Walking shoes are built very differently from running shoes. If you are walking as your workout, don't wear running shoes. Buy shoes designed for walking -- shoes that provide good support and stability in the heel. Walking shoes have a wide heel base, and they have stiffer rubber in the heel compared to running shoes. You need good arch support, and your forefoot and toes need to feel comfortable but not tight. If you've ever taken an aerobics class, you've experienced the wide range of movements and motion. One moment you might be skipping or marching and the next you might be moving side-to-side or twisting. To prevent sore calves, a good aerobic or cross-training shoe is a must. This type of shoe will give you excellent cushioning, shock absorption and arch support as you move through all the various movements. Your shoes need to fit snug both in the heel and forefoot so your foot doesn't slip around. If your foot starts slipping, your calves will work overtime to try and stabilize the rest of your body. Just as running, walking and aerobic shoes all differ and are designed for the sport, so are shoes for basketball, tennis and other sports. The American Academy of Podiatric Sports lists the major manufacturers of various sporting shoes and provides additional tips on how to pick the right shoe for your favorite sport or activity. Wear the shoes only for the workout itself. Keep track of the number of miles you have put on your shoes or the hours you've logged in them. After the equivalent of 60 hours or 300 to 500 miles, your shoe support starts to break down. Sore calves, ankles, knees or low back pain are all warning signs that it's time to buy new shoes. While your shoes may still look like new, don't ignore these warning signs. Investing in the right shoes will keep your calves and the rest of your body happy. 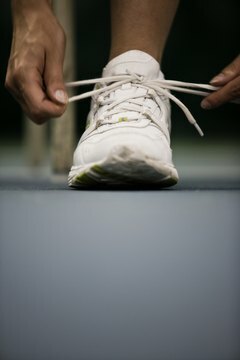 American Academy of Podiatric Sports Medicine: How Do I Know When It Is Time to Replace My Athletic Shoes?